Ensuite shower with basin, washing machine hidden in a cupboard and lots of storage every where, under bed, all around the bed. Some windows open and the escape hatch is used for ventilation during the summer season. a sliding door allows to close the aft cabin but also give much more space to move around. next is the electric head with basin. Under the steps leading to the saloon is a good access to the engine room, especially the grease stern glance and filters. Large almost square saloon with confortable sofa used as 2 single bed for occasional guests. Interior helm and all the navigation equipments. the saloon table is very light and usually moved to the aft deck in summer to enjoy dining outside and entertaining. note that the dinette table is not collapsable and can't be used as a double bed. forward cabin, with a double bed (150x190) with headroom of 1.79 for guests or family. Open CPM program to download on your computer used as GPS, with all the world navigation maps. Dutch steel cruiser for sale in France. 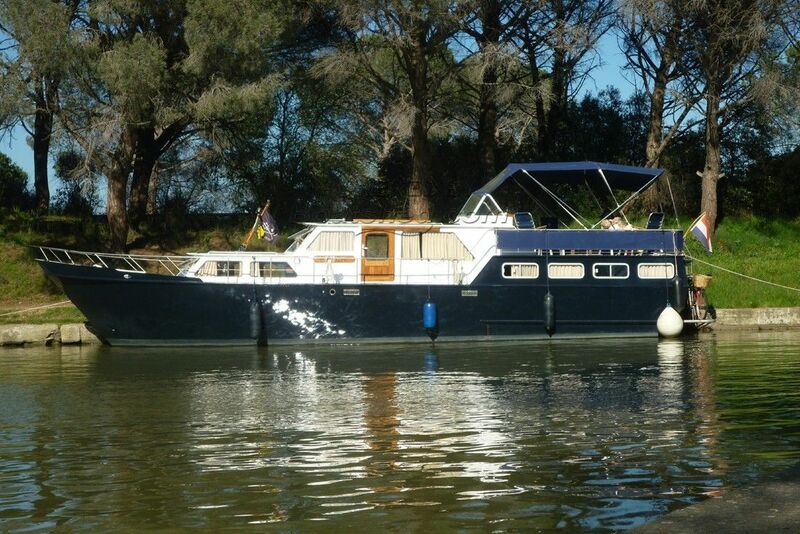 Boatshed Midi Canals is pleased to offer this Dutch steel cruiser from 1980, left the yard in 1980 but was completely refitted inside and hull blastered and painted in 2014. Quality professional refit, wood panels every where, huge aft cabin and a comfortable, bright and unusual wide saloon with 2 sofa on each sides. I really liked the 2 identical sliding doors to access the large side decks. A very comfortable cruiser for living on board all year long. Great central heating everywhere, two comfortable cabins and lots of storage everywhere. This cruiser has been used as a live aboard by our vendors until now but due to illness their need to change their plan. If you are interested in that boat or organise a visit on board, please contact us, at Boatshed Midi Canals. This Dutch Steel River Cruiser has been personally photographed and viewed by magali WHARMBY of Boatshed Midi Canals. Click here for contact details.